Two popular Vietnamese Street Food in Thanh Da Market are Fried Chicken with Boiled Broken Rice and Grilled Pork with Vermicelli. Most viet nam, especially young people really love it. It not only ischeap, but also is delicious.This is the main place for selling of Thanh Da people. In market, there have many food stores. They are really cheap but I have to admit that the flavor is delicious as well. And for me, fried chicken with boiled broken rice and grilled pork with vermicelli are most amazing. This food store stays at the main street of market. There always have many customers come to eat in hanoi. 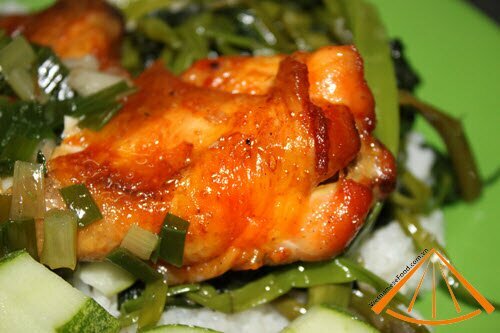 Chicken Meat is marinated by fish sauce, sugar, honey. It is the secret recipe of store. When it is done, the face of chicken meat has a yellow color with the delicious flavor. Moreover, the price of most Vietnamese Street Food is really cheap. 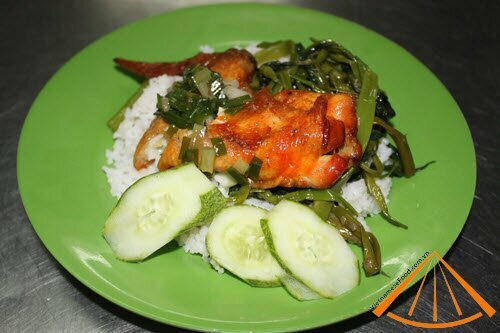 With this dish, you only just pay about 20,000 VND (=1$US) and you can have a big dish with boiled broken rice, fried chicken and vegetable (usually is fried Ong Choy and sliced cucumber). One simple presentation dish uses with Vietnamese Dipping Fish Sauce will create a stunning flavor ever. From cheap ingredients but the quality is so amazing. In addition, boiled broken rice is cooked so soft and sweet. Chicken Meat is the most important ingredient for dish. The skin is crispy but inside is so soft, sweet and spicy. Really delicious. 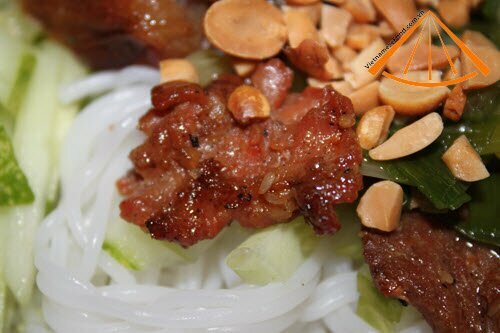 Next popular Vietnamese Street Food is Grilled Pork with Vermicelli. 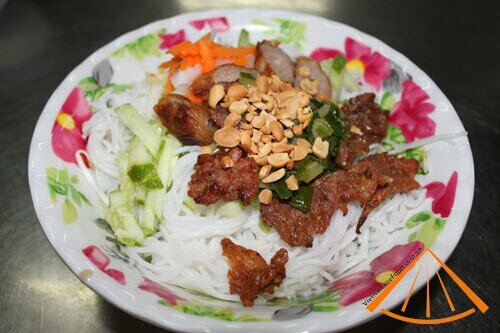 Not including many ingredients, however this dish is really amazing combine with fresh vermicelli, grilled pork, grilled meat roll with vegetable and Vietnamese Dipping Fish Sauce. One bowl of grilled pork with vermicelli is the combination of colors. The white of fresh vermicelli, yellow brown of grilled pork, green of vegetable and a little red from sliced chilies will create an amazing painting on dish. To sum up, there still have other dishes in this place as rice spaghetti soup with fish balls, fresh vermicelli with fish balls, grilled pork boiled broken rice. You can enjoy any delicious Vietnamese Street foodin Thanh Da market. At the right gate of market, go more about 20 meters, you go to the second food store in right hand. This store will open from 5pm to 22pm. Each dish is only 20,000VND (1$US). Read more: The beauty of Ham Rong Mountain in sa pa, Lao Cai.